For those of you who weren’t aware, The Ultimate Fighting Championship (@UFC) was recently sold for US$4 Billion. Forget that this stands to be the most expensive transaction for an organization in sports history, but this is a GREAT payday for the UFC, considering that the owners bought the debunked organization in 2000 for $2 million. To say that this is huge for the sporting and entertainment industry is an understatement! For the new owners, the UFC represents a prime source of new content, particularly in the digital arena. WME-IMG is a talent agency juggernaut with services in marketing and talent management to television and digital distribution. Already established in the sports arena, acquiring the UFC is the latest step in creating a huge stable meant to command digital media and becoming a platform for content. That’s right – CONTENT. And there are still those in our industry arguing the value of content. So what does this mean for the future of the UFC? You can guarantee that the new owners will further-expand the global reach of the UFC in broadcast, as well as exponentially develop the digital footprint of the growing sport. For the likes of Mixed Martial Arts (MMA) superstars such as Georges St Pierre (CAN) and Rhonda Rousey (USA), the UFC has propelled their martial arts careers and turned them into international superstars. And the talent pool of fighters has consequently developed substantially over the last 15 years – with Mixed Martial Arts at a regional and local level more popular than any other period in sports history. “It isn’t hard to travel to any major city in the world and NOT find a Mixed Martial Arts gym – full of beginners right through to advanced fighters. And the calibre of these local fighters is nothing short of impressive!” – says Joe Packard – Marketing & Business Development Director of Hard Knocks Fighting Championship in Canada. “You can train at any major MMA gym today and train with talented and seasoned UFC-ready fighters – world-ranked or not”. In fact, Mixed Martial arts on a local and regional level continues to provide massive growth for the UFC and other MMA organizations competing in this space. 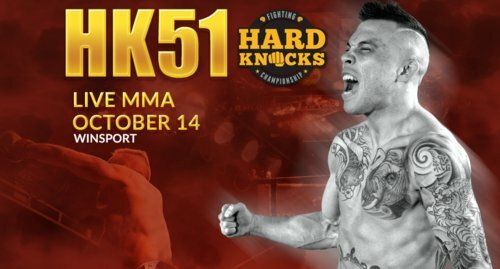 Hard Knocks Fighting Championship (@HKfighting) – who have hosted 50 MMA events since 2009 and now deliver over 480 million digital impressions per year by way of PPV, digital streaming and other online activities via social media, see the lucrative opportunity of taking talented local and regional fighters to the world stage via way of digital. And they are very aware of the fact that Hard Knocks serve the likes of UFC as a feeder pool of up-and-coming fighter talent. “It goes without saying that any one of the fighters on the Hard Knocks roster would be ready to fight on the UFC circuit. Many fighters who have fought for Hard Knocks have gone on to have very successful careers in the UFC” – said Joe Packard. However, with the UFC seeking new ways to grow their digital footprint, combined with the depth of the talented fighter pool across the globe, the UFC is in a unique position where they are unrivaled in their ability to cherry-pick the most talented and entertaining fighters. Mark Vella – Founder of Calgary-based advertising platform advertiise.com (@advertiise) runs regular coaching clinics with Canadian MMA fighters and preaches the importance of the ability to ‘sell themselves’ beyond their cage skills. “The truth is that some of the best fighters will never make it to the UFC because they either don’t know how to grow their audience and captivate a crowd, or simply don’t have an appreciation for the new competitive space we’re playing in”. A former competitor himself, Vella understands and appreciates how the advertising and marketing aspect of the sport has changed and what it takes to stand out in the crowd. “And for a fighter, it’s not enough to be the best in the cage any more. You have to be able to build a fan base. You have to be able to sell tickets and PPV events. All the tools (social media) are readily available to every one – for free”. In the end – it is a cost/benefit analysis for major promoters. If you can’t bring in ticket sales/PPV/merchandise sales, the likes of the UFC will bet on someone who can.